Ten Speed Press, 9780399578946, 176pp. A graphic novel-style history of baseball, providing an illustrated look at the major games, players, and rule changes that shaped the sport. This graphic novel steps up to the plate and covers all the bases in illustrating the origin of America's national pastime, presenting a complete look at the beginnings (both real and legendary), developments, triumphs, and tragedies of baseball. It also breaks down the cultural impact and significance of the sport both in America and overseas (including Japan, Cuba, and the Dominican Republic), from the early days of America to the flying W outside Wrigley Field in 2016. Featuring members of Baseball's Hall of Fame and modern day stand-outs—including Cy Young, Babe Ruth, Jackie Robinson, Hank Aaron, the 1930s New York Yankees, the 2004 Boston Red Sox, the 2016 Chicago Cubs, and more—The Comic Book Story of Baseball spotlights the players, teams, games, and moments that built the sport's legacy and ensured its popularity. ALEX IRVINE is the writer of the games Avengers Alliance, Marvel War of Heroes, and Marvel Puzzle Quest, which together have seen more than 50 million players. He has also written comics (Daredevil Noir, Iron Man: Rapture) and novels (The Ultimates: Against All Enemies, X-Men: Days of Future Past, Iron Man 2) for Marvel. He wrote the novelizations of The Adventures of Tintin, Pacific Rim, and Dawn of the Planet of the Apes; other tie-in novels include Transformers: Exodus and Supernatural: John Winchester's Journal. His award-winning original novels include Buyout, The Narrows, and A Scattering of Jades. TOMM COKER is a comic book artist and film director/writer. He has drawn comic books for Image Comics, Dark Horse, Marvel Comics, and DC Comics. C.P. SMITH is an illustrator and comic book artist who has worked for Marvel Comics and BioWare. ". . . a lively and accessible chronicle of America’s pastime, with panels that crack and wallop with image and fact." "Heroes, villains, long odds, and tall-tales: baseball history should always be presented in comic book form. The Comic Book Story of Baseball is probably the most accessible history of the game I've ever held in my hands. I'd recommend this little gem to anyone who wants to learn the history of the game and its colorful characters." 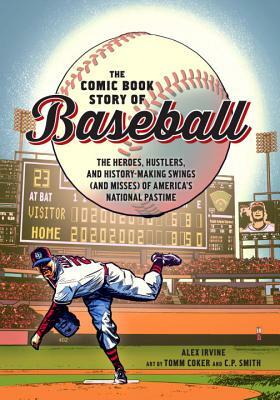 "Two great American art forms collide in The Comic Book Story of Baseball, and the result is a sprawling, comprehensive, tremendously fun look at the national pastime. It’s all here, from the Babe to Buckner, billy goats to Barry Bonds. Writer Alex Irvine and artists Tomm Coker and C.P. Smith exalt baseball’s triumphs while reckoning with its sins, and the result is a rich, thorough history that you’ll return to again and again, just like the grand old game itself."